Japanese comics and animation sold many people around the world on the intrigue of modern Japanese culture. Sure we all knew about samurai, but many of us never would’ve guessed that back in the 80s Japan was on the cutting edge of sci-fi storytelling. These media are a great way to get an insight into the culture. You’ll hear plenty of folks say that Japanese people don’t get sarcasm, for example; however, their brand of sarcasm is just a little unique and you can quickly acquaint yourself with it through comics. It’s also a great way to kick off your reading endeavors if you are a student of the language. In this article, we’re going to just take a quick peek at some comics-related language. Tomomi: Nani o yonderu no? Sam: “Koukaku Kidoutai” to iu SF manga da yo. Tomomi: Heee. Watashi no o-susume wa “Rekishi Ito Souko” da yo. Tomomi: Sekai-shi no jinbutsu ni tsuite yon-koma toka egaiteru. Shikamo, netto de muryou de yomeru yo. Sam: Itsumo fantajii ka SF ga suki dakedo, sono manga wa omoshiroisou da ne. Sono saito o chekku shitai kara, ato de meeru de URL o okutte moraeru? Tomomi: It’s mostly a 4-panel comic about historical figures. What’s more is you can read it online for free! Sam: Usually I like fantasy or sci-fi, but that sounds interesting. I’d like to check out that site, so can you send me a link to it later? *As I am writing this article there is no actual English title for the webcomic. It’s name is broken up into 3 parts: rekishi, ito, and souko. These translate to history, thread/string, and warehouse/storage. So we have a smattering of comic and fandom-related terms, and a little bit about how to start a conversation about what you’re into and make a recommendation. In the last article I talked a good bit about katakana loan words from English, and fortunately many modern words for genres have also been borrowed from English. Incidentally, even the word genre—although there are many ways to say it in straight Japanese—is often “ジャンル” (janru). 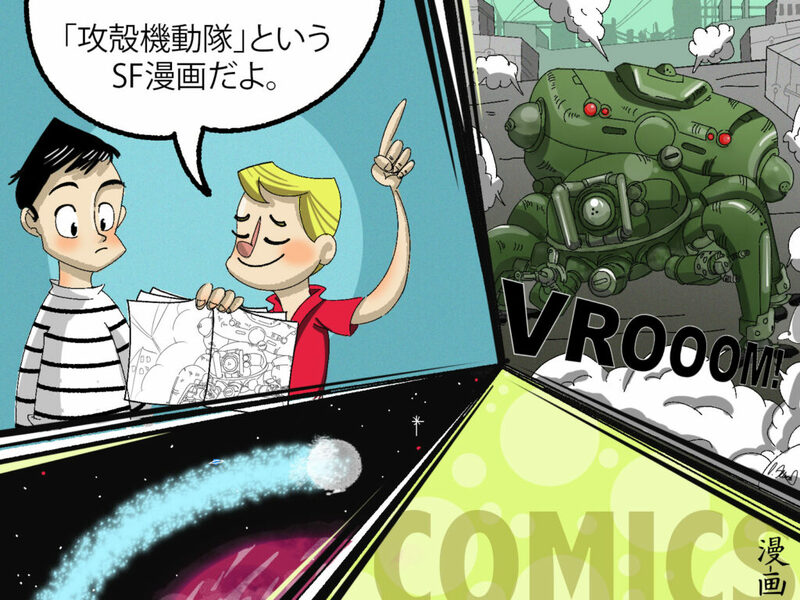 Here we have SF—read es-ef—for sci-fi, and ファンタジー (fantajii) for fantasy. Not all genres are this easy to remember, but it makes for a good start. Just like SF, there’s also URL, which is spelled out when spoken. And like the previous sample conversation on music, there’s a nice collection of katakana loan words here: ネット (netto) for internet, サイト (saito) for website, and メール (meiru) for e-mail or sms text messaging. チェック (chekku) for check is a little more versatile in many of the ways that the word is in English; it usually means to verify or double-check, and in that vein it can mean to look something up or seek something out. There are a few neat, little things you can take from certain aspects of the grammar here that make for good additions to the fundamentals of anyone’s Japanese. One of the easiest things to incorporate is か. Now, you may be familiar with か as marking questions, but it can also be used to mean “or,” as in マフィンかベーグル (muffins or bagels). Another easy thing to make use of is really more of a phrase than a particular grammar rule: 私(わたし)のお私(すす)めは～ (watashi no o-susume wa), which means “My recommendation is ～.” That wording may be a bit clunky in English, but in Japanese it’s the same as “I recommend ～.” It’s a straightforward way to recommend restaurants, vacation destinations, pachinko parlors, etc. Now for something a little more widely used in Japanese we need to look at the last line where Sam asks Tomomi to send him a URL. He uses a verb in て-form along with もらえる. 送(おく)ってもらえる is a polite way for Sam to ask Tomomi to send him something. In order to make this a question you’ll need to make a slight up-swing in tone at the end much like in English, e.g. “You like me?” would end with “me” being in a higher pitch than “You.” Another thing that’s important is that when using もらえる to talk about something it places emphasis on you the speaker. Another verb くれる can also be used similarly to もらえる, but it places emphasis on your friend giving you the thing rather than on you receiving the thing. The more Japanese you encounter the more this will just start to make sense, but for now try and make use of “thing を送ってもらえる？” to ask if someone will give/get something for you. For the 漢字(かんじ) in this dialogue I want to point out a suffix and a prefix. The better your Japanese gets the more you’ll find you have an understanding of how Japanese words are formed, which can allow you to make up words or discover words that everyone will understand. It also clues you in when you encounter words you haven’t learned yet. In the above we can see the suffix 史 in the word 世界史(せかいし). You may recognize it from 歴史(れきし) meaning “history.” And when it is used on the tail end of a word it means the history of whatever it is attached to. That’s why 世界 (world) plus 史 gives us world history. Or 日本史 (Japan+history) is Japanese history. This is more useful in reading than speaking since making up say ゾンビー史 (zombie+history) for the history of zombies might not immediately come across in conversation; however, if you write it out it would be easy to understand. The prefix we see in the dialogue is 無(む)～ which works the same as un～ or in～ in English, meaning “not.” Above is 無料(むりょう) (mu+ryou) which is not+fee, and if there is no fee it must be free! Similarly 無知(むち), or not+knowledge, means ignorant. In the same way that many people learn the parts that make up kanji, or radicals, to better understand their meanings and how to write them, you can learn the common parts of words and what they mean in order to more readily grasp what you’re reading without a dictionary on hand. As your ear gets more and more trained to certain sounds, you’ll also start to recognize these suffixes and prefixes in conversation, which can help you stay in the dialogue rather than getting left out.